Can a President Really Take a Vacation? The sun over Hawaii may seem pale now that President Obama is basking in the glow of his legislative victory: getting a health care bill out of the Senate. Left: Then President-elect Barack Obama greets onlookers after a work out at a Marine Corp base in Hawaii Dec. 27, 2008. He might have found it difficult to relax on his 11-day vacation in the Aloha State if the Senate had not acted on the morning of Christmas Eve as he had hoped. In any case, he's already learned one of the hard truths of his job: that the president of the United States is never really on vacation. At best, they are working vacations. Some more than others. As is the case wherever he goes, a small army in the range of 200 aides, Secret Service, communications and transportation personnel accompany him or are in place in Hawaii. He gets daily intelligence and national security briefings. High-tech communications equipment and capabilities are at his disposal, including SVTC: secure video teleconferences. The acronym is pronounced SIH-vihtz. The president will have "an extensive network of whatever is needed to stay on top of whatever situations happen," says Press Secretary Robert Gibbs. As hard as American presidents campaign to get into the White House, they find they need to get away from it occasionally. So far, President Obama has taken only 15 vacation days. 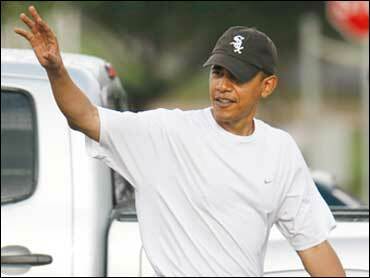 He had a four-day weekend at home in Chicago last February and spend eight days on Martha's Vineyard in August. He also combined business and pleasure taking the family with him last summer to Montana, Wyoming and Arizona. He did a couple of town meetings on his health care proposals, but he also got time for some fly-fishing and visits to Yellowstone and the Grand Canyon. Since taking office, President Obama has made 11 visits to Camp David, spanning all or part of 27 days. They're mostly weekends and cannot fairly be counted as vacations. His immediate predecessor was more inclined to take a break from the confines of the White House. Our CBS News tally shows President George W. Bush made 9 visits to his Texas ranch, spending all or part of 69 days there during his first year in office. Mr. Bush also made 25 visits to Camp David in 2001 totaling 78 days. And he spent a four-day weekend at his folks' place in Kennebunkport, Maine that year. During Ronald Reagan's fist year in office, he made seven trips west to his California ranch, spending all or part of 42 days there. He also spent 57 days at Camp David in 1989, having made 19 visits to the presidential retreat in Maryland's Catoctin Mountains, most of them weekend respites. The Reagans also spent three or four days every year in Palm Springs, Calif., as New Year's guests at the estate of friend and philanthropist Walter Annenberg. Jimmy Carter spent 19 days on "vacation" during his first year as president – most of the time at his home in Plains, Ga.
Past and present presidential aides, regardless of party, defend the need of the chief executive to change venues occasionally. And they are quick to remind that no president can get away from it all: the awesome powers and responsibilities of his office follow the president wherever he goes. "I don't think the American people begrudge a president taking some time with his family that's well-earned and well-deserved," said Gibbs last summer. Not even to Hawaii – where I hear it's 81 and sunny. Perhaps even at night.